On the tenth day of Christmas, my true love gave to me… ten easy merges. In the previous lesson, we learned about using remote branches with Git to share branches on remote repos, which makes collaborating with other very easy. Today, we’re going to to learn about merging different versions with Git, so that we can fix conflicts when more than one person changes the same part of a remote branch. At the end of the last lesson, we had pushed our father-christmas branch up to GitHub, and in that branch the index.html file was different than the one in the master branch. Assume that we are happy with the work we’ve done in the new branch, and we want to include it in the main version of our project. First, make sure you have your master branch checked out (git branch shows an asterisk beside the name master). If not, check out the master branch (git checkout master). Now we’re going to merge those changes into master. The changeset with commit hash 7f67565 is being merged into the changeset with commit hash 384888c. The merge is able to take place simply by fast-forwarding the current branch from its current commit to the one commit of the one being merged. The merge affects index.html in 4 lines. The two pluses (++) mean two lines were added; the two minuses (–) mean 4 lines were deleted. The last line is a summary of total number of files affected, the total number of lines added, and the total number of lines deleted. If the merge had been more complicated, the second line may have listed recursion as the merge method used. If any additional files had been involved, each file would have been listed on its own line. Finally, if Git was not able to merge the two branches automatically, there would be additional lines with the details of where the two branches conflict. Let’s contrive to create a merge conflict so that we can then fix a conflict. Start by creating a new branch called pere-noel, pushing it up to the remote repo, and switching to the new branch. Now, edit the index.html again, and change both occurrences of Father Christmas to Père Noël. Add your changing to the staging area, commit your changes to a new changeset, and then push those changes to the remote branch. You now have three (3) branches in your local repo, and remote copies of those same three branches in your remote repo on GitHub. Normally, to encounter a merge conflict you would have to commit a change in your local repo, and someone else with access to your remote repo would have to commit and push a change that affected some of the same lines you changed. To simulate this situation without having to involve another person, we will take advantage of the GitHub feature that allows you to make edits to your remote repo through its GitHub web page. On GitHub, select the index.html file and use the branch dropdown menu to switch to the pere-noel branch. Then, click the Pencil icon in the list of icons on the right side of the gray bar directly above the file listing. 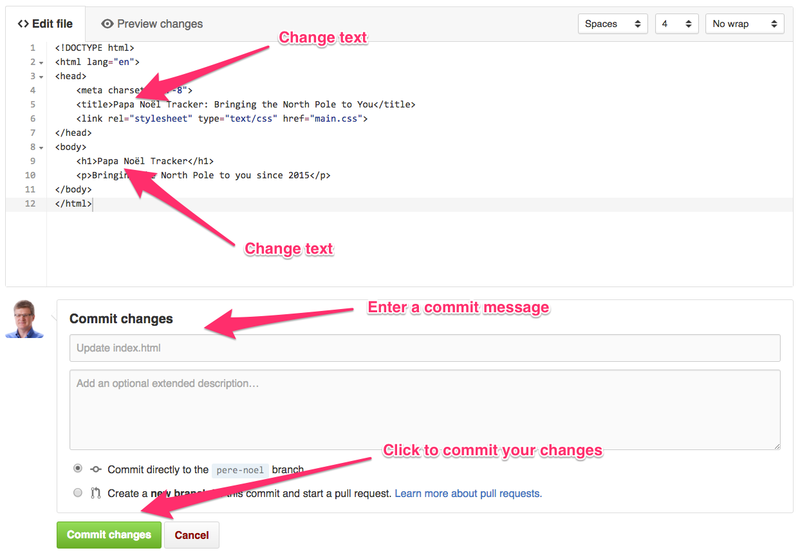 Change Père to Papa on lines 5 and 9, enter a commit message and click the green button to commit your changes. Now, back on your local machine, make sure you are still on the pere-noel branch. In the index.html file, change those same two lines (5 and 9) so that they read Saint Nicholas instead of Père Noël. Add and commit those changes. Then, try to git push. You will see the following message. You can’t overwrite the new changes to that branch on GitHub with your local changes. This is one Git protects everyone from losing work. Instead, Git suggests what we need to do, so try git pull. Now you will see this. If you run git status right now, you will see the following. You have to edit the file with the conflict, index.html, and commit the edit before Git will let you finish the merge. When you open that file, it will look like this. Notice that Git has automatically added lines to highlight what cannot be merged automatically. The lines from <<<<<<< HEAD to ======= are those that come from the current state of your local branch. The lines from ======= to >>>>>>> 9cf348c866da81caca26e9d74da481c342e96cb0 are those that come from the state of that branch in the remote repo. To fix this particular conflict, let’s just delete the markers lines and every line from the remote EXCEPT its version of the <h1> line; delete the local version of the that line. You should save the file when it looks like this. Type git add -A now, and then git status. Now the status message looks like this. Finish the merge with an appropriate message, and push the merged result to the remote branch. In this lesson, we’ve covered the useful, and sometimes tricky, concept of merging versions with Git. Check back tomorrow, when we’ll learn about Stashing Changes with Git until You Need Them.